Many Customer Success teams measure their performance via customer retention and expansion rates. These aren’t bad measures – KPIs should generally measure outcomes – yet those KPIs are lagging. A good CS leader needs to know how well team members are strengthening customer relationships. And they need to know it well in advance of a renewal / sales event. That is, getting leading indicators of team performance is the key to successful coaching, improvement, and accelerated growth. 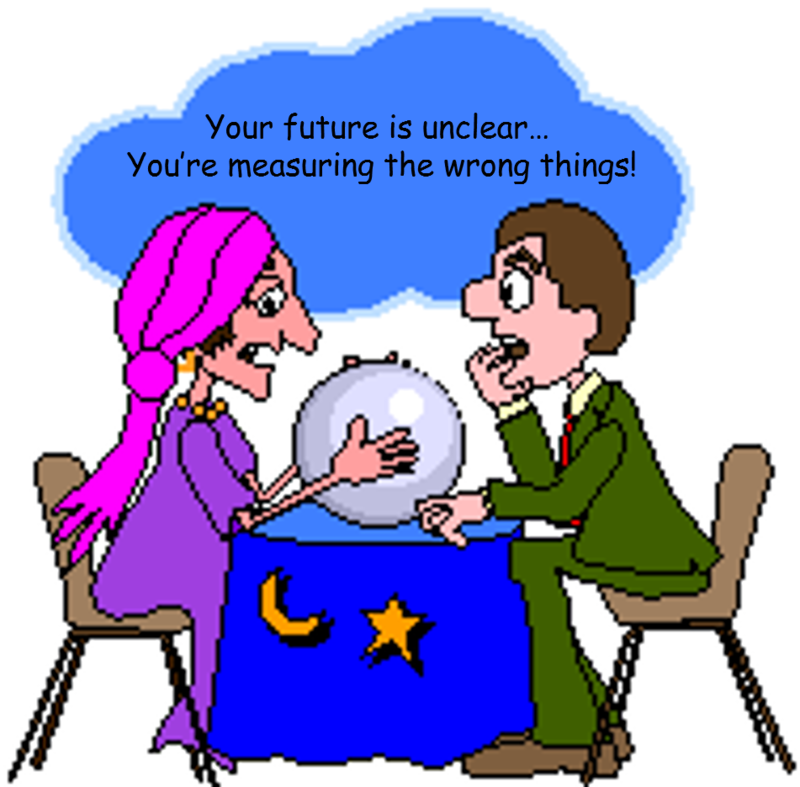 So what metrics are good indicators of strengthened customer relationships? Loss of an executive sponsor or critical contact in the account: When a key player leaves the company suddenly you, the “vendor,” have little support from the customer. Non-responsive contacts in the account, especially from executive sponsors: Why won’t those folks respond to you? Loss of wallet share or inability to expand: Competitors might already be in your account. Whether you are both working with the same team or are in other parts of the business, you’re looking to displace them as much as they are looking to displace you. And of course, the dreaded cancellation: This is always top-of-mind. Strengthen relationships with your core constituencies. Mitigate your risk by making sure there is a strong relationship with more than 1 person in the account. Even better, make sure there is a strong relationship between your company and all the members of the “buying committee” (the people that hold the budget and make / influence decisions regarding your products and services). Differentiate and add value for your customer contacts at every interaction. Never “check in.” Make sure to offer or add value, or provide a “What’s in it for me” (WIIFM) reason for someone to engage with you. Make sure those key contacts are perceiving value from your company. With those objectives in mind, the key is to measure adherence to processes that execute on those solutions. As an example, we all know a key measure of Sales performance is attainment of quota. But a good sales manager never waits until the end of the quarter to find out if the team is being successful: They’ll measure percentage of deals (or quota) in each phase of the sales stages and ensure there are well-defined exit criteria before moving to the next phase. A new sales opportunity generally doesn’t enter a proposal stage without already having well-defined needs (problem) statements, identified budget holders, and evaluation criteria. A good sales manager helps the team acquire and build on those items from the prospect via clearly defined processes. Know that people want to be heard. Use that to your advantage. Know that the most successful CS operations engage the right people to (1) Ask your customer contacts simple questions to find out what’s working and what they would like to see improved, then (2) jointly define problem statements linked to appropriate solutions with the impacted people. For example, perhaps you see a number of end-users not using the product or expressing frustration, and realize those customer employees are relatively new and never went through the formal training program. With that problem identified you can now (3) work with the customer to craft the resolution plan, and (4) be sure to jointly (both you and the customer are certain to play a role in the solution) execute the plan, with appropriate communications along the way. Foisting a “solution” upon someone that isn’t part of this process does nothing to strengthen the relationship. Know that those that don’t want to participate in the process probably don’t feel enough “pain.” You’ll need to show them the opportunity. What do they lose out by not participating? What do they gain by collaborating with you? Engage the right contacts with an open mind. Ask them what they think about the things that matter most to them: value, ease, quality, and contribution to their success. Consider using a B2B-centric customer feedback tool such as TopBox to be able to collect and visualize the health of the account in a scalable way. You couldn’t possibly create account plans for 100% of your large/strategic accounts at one time, so why ask your customers for feedback all at at once? Engaging each of your “top” accounts well in advance of their individual renewal event ensures there are no surprises later. And collecting feedback in this manner gives you a powerful vehicle for sharing it in a trustworthy (direct) manner with other departments inside your company. Avoid the “telephone” game that has skeptics contradicting what you hear from various customer meetings because they’ve heard something different from a smaller set of customer contacts. You’re all on the same team and should be working from the identical inputs to get to the right outcomes. Amplify the voice-of-the-customer by ensuring everyone across the company hears customer feedback directly to know what’s working along with the optimal improvement opportunities. Include the right customer contacts in your account-planning processes (i.e. what you are going to do about what they told you). Allow them to have a voice in how you work with them. Show everyone how you listen and drive real-world results. 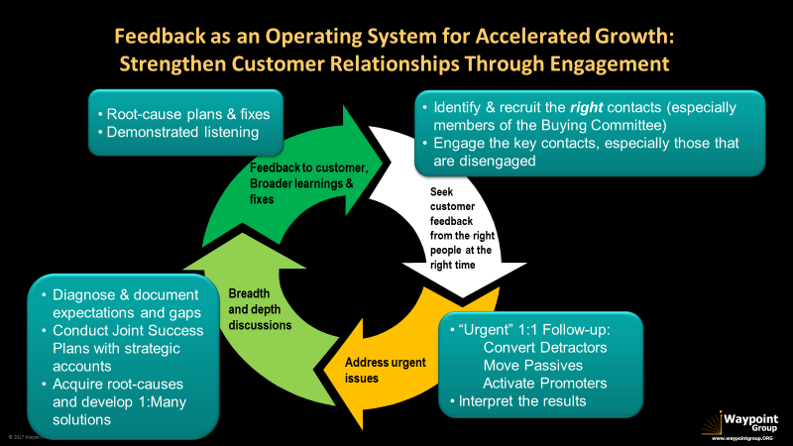 Feedback as an Operating System for Accelerated Growth: Strengthen customer relationships by engaging the right people at the right time via a simple closed-loop feedback process that uncovers hidden concerns and addresses them before they cause harm. What percentage of accounts have the Buying Committee clearly defined in Salesforce? It all starts here… if you don’t even know the right contacts then how can you strengthen relationships? From what percentage of accounts (and/or revenue) are you hearing what is working and what needs improvement? Remember that not all accounts are equal – loss of a large strategic account is probably more painful than loss of a small or non-profitable account, so consider “voice to value” and prioritize engagement with those accounts that matter most, and at a point-in-time that gives you plenty of runway to address the situation. For what percentage of revenue do you have a Joint Success Plan defined and agreed with the account? For what percentage of accounts/revenue are you measuring and obtaining the agreed milestones? For what percentage of accounts have you identified expansion opportunities? The good news is that these measures can be easily obtained with a bit of configuration in Salesforce and your customer feedback tool, such as TopBox. We’ve written a whitepaper on this topic that provides step-by-step details that will allow your CSMs to engage the right customer contacts with the right plays. And we’ve also provided a Joint Success Plan (JSP) template to drive the discussion (nay, customer-facing “QBRS” that become poor sales pitches for all your own stuff… use that extremely valuable time as a customer engagement opportunity!). A critical added benefit: Now that you have the customer insight to drive the critical 1:1 relationship strengthening activities, it’s an easy next step to share and amplify the voice-of-the customer across your company so everyone can hear and see what’s working and not working. The more you can share, the easier it is to engage those that need to have your back (including Product, Finance, Support, Sales, and Leadership). What is your CS process? Are you measuring those stages in the process that matter? Are you engaging the right contacts in the account, strengthening relationships, and demonstrating value? If not, are you optimizing your investment of time and resources?